Kensington Palace said "like any couple getting married, Prince Harry and Ms. Markle have taken a great deal of care in selecting all elements for their service"
James Vivian, Director of Music at St George's Chapel in Windsor directs the St. George's Chapel Choir during a rehearsal before evensong and ahead of the wedding of Prince Harry and Megan Markle on May 14, 2018, in Windsor, England. Prince Harry and Meghan Markle will marry in an Anglican service with an American flavor that mixes prayers, classical music, a gospel choir and sweet soul sounds. Kensington Palace has released the order of service for Saturday's ceremony in the 15th-century St. George's Chapel at Windsor Castle. The service will be led by the Dean of Windsor, David Conner. Archbishop of Canterbury Justin Welby will solemnize the marriage, and the head of the U.S. Episcopal Church, Michael Bruce Curry, will deliver a sermon. Markle, who attended a Roman Catholic school, has been baptized into the Church of England, of which Queen Elizabeth II is supreme governor, as she prepares to join the royal family. The ceremony is based on Common Worship — the most modern of several Church of England service options — and includes prayers and hymns, as well as readings and musical selections chosen by the couple and their family. Kensington Palace said "like any couple getting married, Prince Harry and Ms. Markle have taken a great deal of care in selecting all elements for their service." The palace said it was "a collaborative effort" between the two, and they also consulted Harry's father Prince Charles about the orchestral music being played before the service begins. Orchestral selections include works by Johann Sebastian Bach, Edward Elgar, Gabriel Faure and Franz Schubert. The chapel choir will sing works including a motet by 16th-century English composer Thomas Tallis. A London-based gospel ensemble, the Kingdom Choir, will perform the Ben. E. King soul classic "Stand By Me." Jane Fellowes, the sister of Harry's late mother Princess Diana, will read from the biblical "Song of Solomon," an ode to the power of love that contains the words "many waters cannot quench love, neither can floods drown it." The Church of England doesn't allow couples to write their own wedding vows — they have to stick to the script. Meghan and Harry will vow to have and to hold, "for better, for worse, for richer, for poorer, in sickness and in health, to love and to cherish, till death us do part." Welby, head of the global Anglican Communion will ask them to love, comfort, honor and protect one another — but not obey. That requirement of wives is now widely considered outdated by the Church of England. In front of 600 wedding guests, Meghan and Harry will exchange rings before Welby declares them husband and wife with the words: "Those whom God has joined together let no one put asunder." 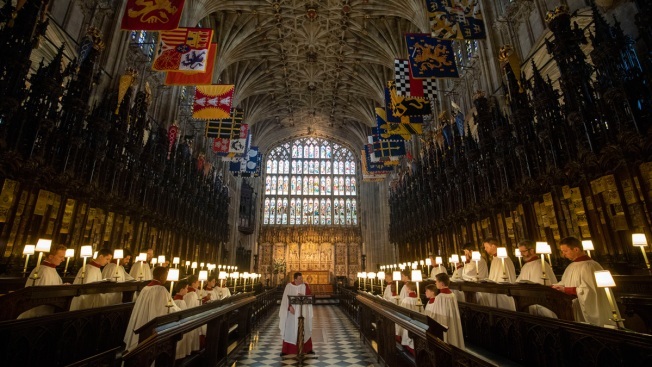 After guests sing "God Save the Queen," Britain's national anthem, the newlyweds will leave the chapel to the strains of an allegro from "Symphony No. 1" by 18th-century composer William Boyce, and the gospel sounds of "Amen/This Little Light of Mine."